We expect an awful lot from our entry doors. We need doors that help keep our indoor spaces warm in the winter and cool in the summer. We need doors that are easy to operate but tough enough to help keep us safe. But, when it comes to the gateway to our homes and businesses, we also want doors that are inviting and attractive. Some of us want our doors to make a statement. Others want doors that are a little more reserved. Maybe you want an entry door that complements the architecture of your home or business. Or perhaps you’re looking for a door that reflects your unique taste and personality. At Door Pros, we understand that entry doors are the focal point of your property. 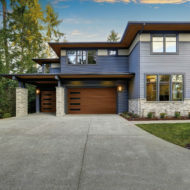 That’s why we carry an extensive line of top quality doors in a variety of materials (including wood, fiberglass and steel), styles (including rustic, craftsman and modern) and colors (eight stains and 18 paint colors). Our doors are beautiful, durable, energy efficient and affordable. They are real showstoppers and add to your curb appeal. The backdoors and side doors we sell are equally eye-catching and effective. Not sure what’s best for you? Don’t let it throw you off track! Our trained technicians have the skills and expertise to help you nail down the choice that’s just right. We will be happy to sit down with you and explore the pros and cons of each option, making sure your new entry door is functional, attractive and reasonably priced. Once you’ve made your choice, we’ll come knocking with our superior door installation skills. At Door Pros, we’ve seen it all and installed it all. We know from the mistakes of others in our field that a poorly installed door can cause a host of problems, including noises, drafts and higher energy bills. We’ll make sure your door is properly framed and installed with the precision and care you deserve. Even the most expensive door ewill fail to meet your expectations if the installation process falls short of our professional standards. When we install your doors, you are guaranteed they will open and close freely, lock and unlock easily and swing or slide smoothly. We’ll also make sure your doors are rattle-free and squeak-free. Most doors, especially our top quality products, are made to take a beating. But even the sturdiest doors can develop problems over time due to wear and tear, neglect and abuse. The team at Door Pros will never try to talk you into a door replacement when a quality repair makes the most sense. 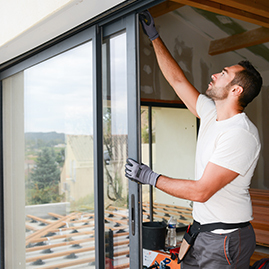 We have the training, expertise and experience to analyze and repair any problem with exterior and interior doors, including sticking, broken hinges, squeaks, dents, rotting wood, damaged rollers, faulty door jambs, broken screens, air leaks and more. 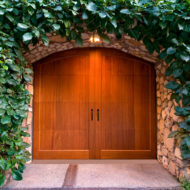 From front doors to back doors to pantry doors to bedroom doors, we truly do know doors inside and out. 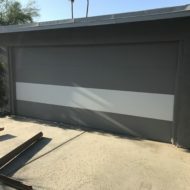 Call us at 760.993.6873 for superior installation and repair services on interior doors, exterior doors, screen doors, French doors, sliding glass doors, pocket doors, closet doors, garage doors and more. We know doors inside and out. You name it. We can repair, replace or install it.